Gold’s price consolidated sideways within a small ‘symmetrical triangle’ for two weeks before a downward breakout occurred on Fri. Jan 18th. The 20 day EMA provided support – as it has done since the beginning of Dec ’18. However, the support may not hold for long. Daily technical indicators are in bullish zones, but looking bearish and showing downward momentum. 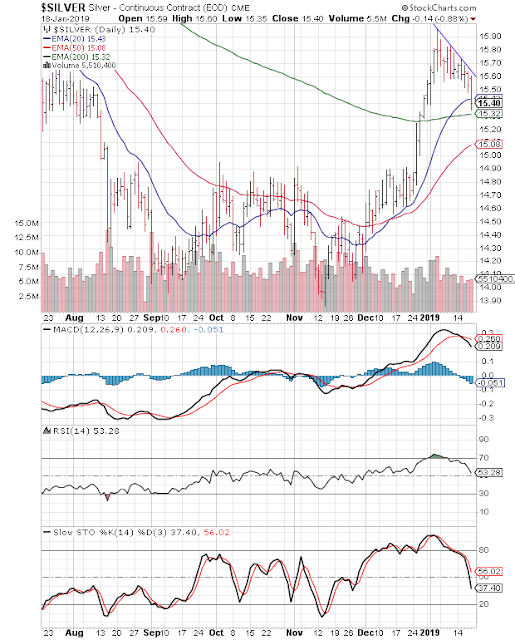 MACD has crossed below its signal line and is ready to drop from its overbought zone. RSI and Slow stochastic are falling towards their respective 50% levels. Gold’s price may fall to the ‘support/resistance zone’ between 1260 and 1270 – where some support can be expected. 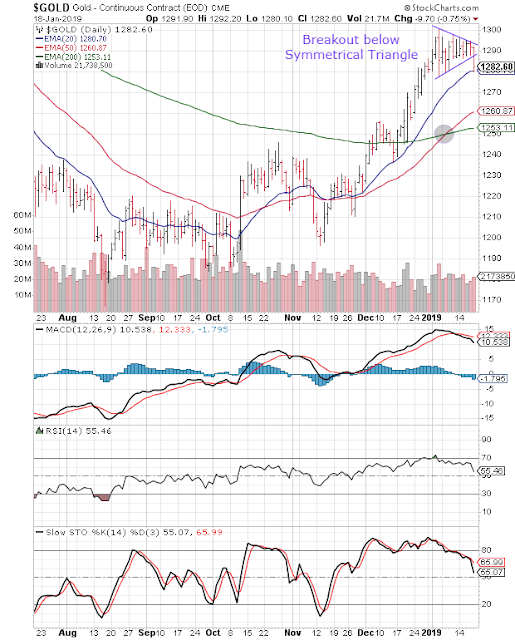 A further fall and a test of support from the 200 day EMA can’t be ruled out. On longer term weekly chart (not shown), gold’s price closed above its three weekly EMAs in long-term bull territory for the fourth straight week. Weekly technical indicators are in bullish zones. MACD is rising above its signal line. RSI has started to correct above its 50% level. Slow stochastic is falling inside its overbought zone. Since then, silver’s price has been in a down trend (marked by purple trend line). On Fri. Jan 18th, a test of support from the 200 day EMA was followed by a close below the 20 day EMA for the first time in 7 weeks. Daily technical indicators are looking bearish after correcting overbought conditions. MACD has crossed below its signal line and is poised to drop from its overbought zone. RSI is falling towards its 50% level. Slow stochastic has dropped below its 50% level into bearish zone. A fall below the 200 day EMA is on the cards. On longer term weekly chart (not shown), silver’s price closed above its 20 week EMA, but below its 50 week and 200 week EMAs in a long-term bear market. Weekly technical indicators are turning bearish. MACD is rising above its signal line in neutral zone. RSI is falling towards its 50% level. Slow stochastic is correcting inside its overbought zone.